The Unfolding of Cricket History | The International Cricket Hall of Fame. 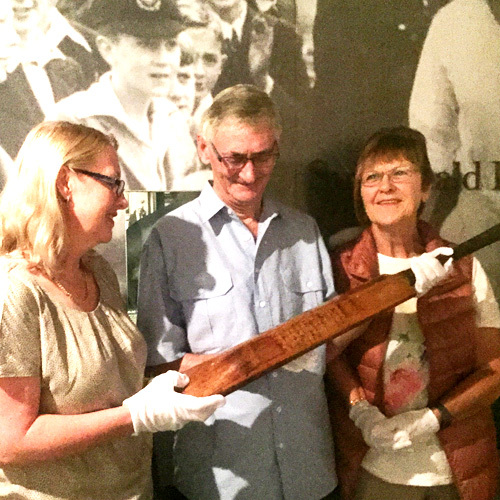 Cricket history converged at Bradman Museum in a rare meeting of descendants from the Bodyline series on March 14. Meeting at the Bradman museum with our Curator David Wells. It was a wonderful one-off opportunity when a son of spectator, and the granddaughter of a great player, got together. The tactic saw England win the Ashes, with Douglas Jardine as captain, and Harold Larwood, England bowler with an extreme pace, as his main protagonist. The tactic was called unsportsmanlike by the Australian Cricket Board, an accusation refuted by the Marylebone Cricket Club. However, within a few years the number of Fieldsmen permitted between the wicket keeper and square leg were reduced making Bodyline bowling ineffectual, and is now illegal in the sport. Despite animosity between Australian and English cricket for a while after the 1932-33 Bodyline series. After retiring from Test cricket, Harold Harwood and his family migrated to Australia (Kingsford, NSW) in 1950, and the Harwood’s were well respected and Harold participated in cricket journalism and commentating. Despite animosity between Australian and English cricket for a while after the 1932-33 Bodyline series, Harold Larwood and his family migrated to Australia in 1950. The Larwood’s were well respected and Harold participated in cricket journalism and commentating. In 1999, his extensive collection of cricket memorabilia was donated to the Bradman Museum. “There was always stuff in his house, there were photos, there were trophies, there was memorabilia from his travels, which we were all allowed to touch and look at,” Karen said. 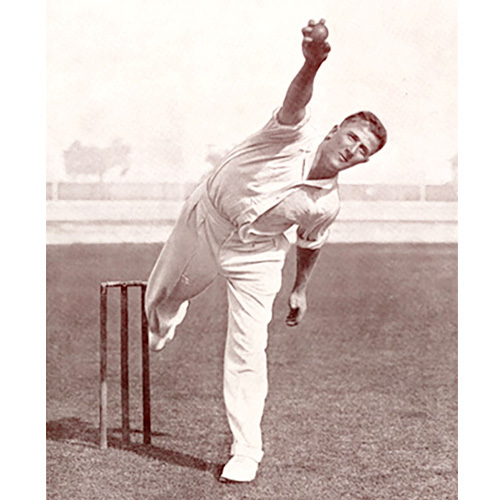 Image of Harold Harwood bowling – from The Sydney Mail, 1932. Supplement leading up to Ashes Test, which later became known as the infamous Bodyline Series. Click here to read the story in the Southern Highland News. To watch archival footage of Larwood playing click here.